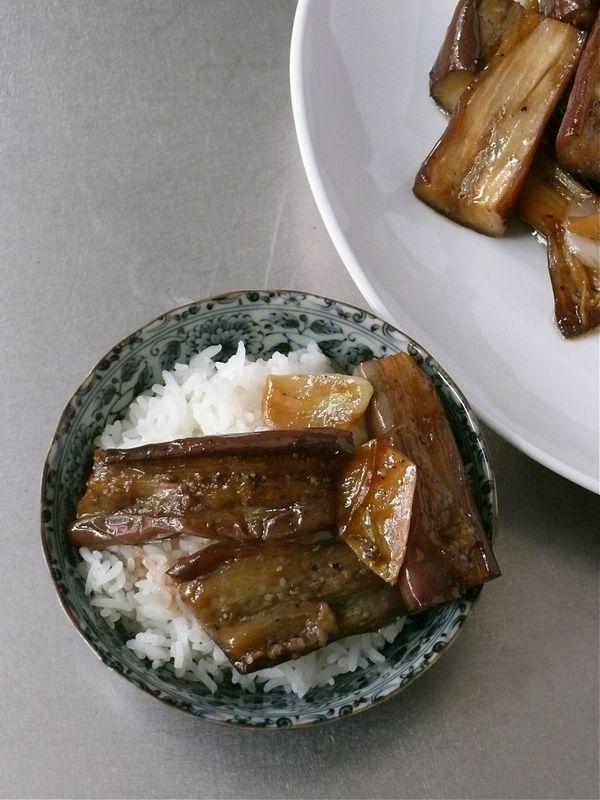 One night James made steamed eggplant and rice for dinner, and I couldn’t get enough of it. I raved, gave thanks, asked for more, asked that he make it again. He knew what was coming, I’m sure. I asked him to write down the recipe so I could share it here. He hates when I do that (it wasn’t the first time). He doesn’t like following recipes and he certainly doesn’t like me following his recipes. And I know why. Because the same dish he made for dinner, once unconditionally loved and praised, was now poked, prodded, questioned and doubted. 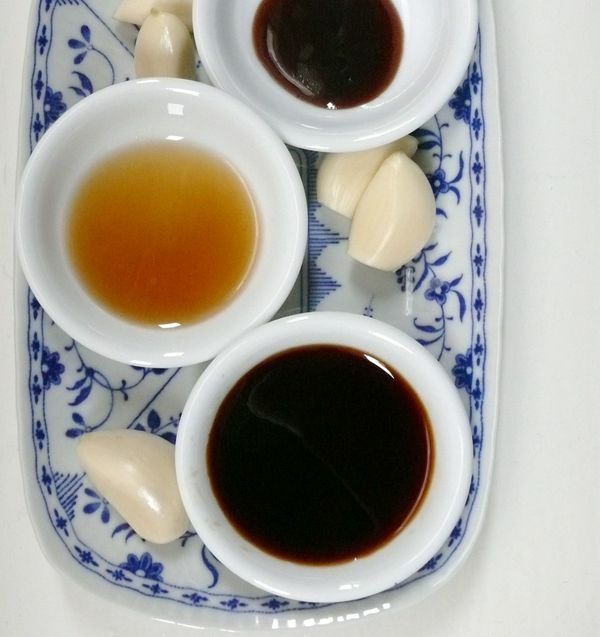 Me: The ratio in your sauce looks… well, isn’t the sesame oil going to overpower it? James: This is the ratio from the time you liked it. You said this was the one. Me: Oh. Good. But why do you add it last? Since you’re already steaming the eggplant, shouldn’t you add the sauce first so it cooks a little and the flavours come together? James: No, the sauce doesn’t need to cook. Me: Then why add the sauce to the pan at all? All of the other ingredients are cooked, you could just toss the eggplant in it. James: Because the eggplant makes the sauce thicker. Trust me. Me: Mmmmkay…. So, why do you steam it sooo much/leave the garlic cloves whole/etc. James: Because that’s how I like it. I thought you said you liked this. And I do. He was right about everything. I had him tweak what I was skeptical about but it was better his way: I saw the sauce thicken with my own eyes–you do need to add the eggplant first–steaming the eggplant a little too much is nice, uneven pieces actually let some breakdown and add body to the sauce. I even asked him to slice some garlic thinner, only to end up picking at the whole, steamed bulbs he’d set aside for himself (yeah, he loved that part especially). In the end–or the beginning, rather, he had a simple, great recipe, and I remembered that I knew that the first time I tried it. *This is James’ recipe and he really loves garlic, so he leaves his cloves whole. In the steamer, they cook fully, becoming soft and much more mellow, but feel free to scale back the amount of garlic and/of slice your cloves if you wish. Line a bamboo steamer or other steamer with parchment paper and set over a pot of boiling water. 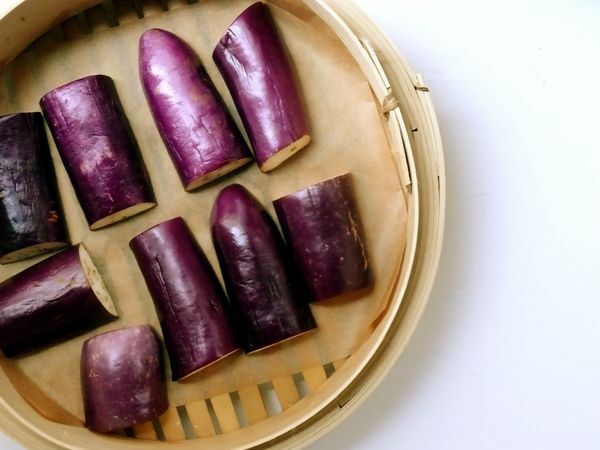 Add eggplant and garlic to the steamer, cover and cook for 3-5 minutes, depending on the thickness of your eggplant slices, until the thickest pieces are just cooked through. Remove from heat. Heat a wok or large skillet over medium-high heat. 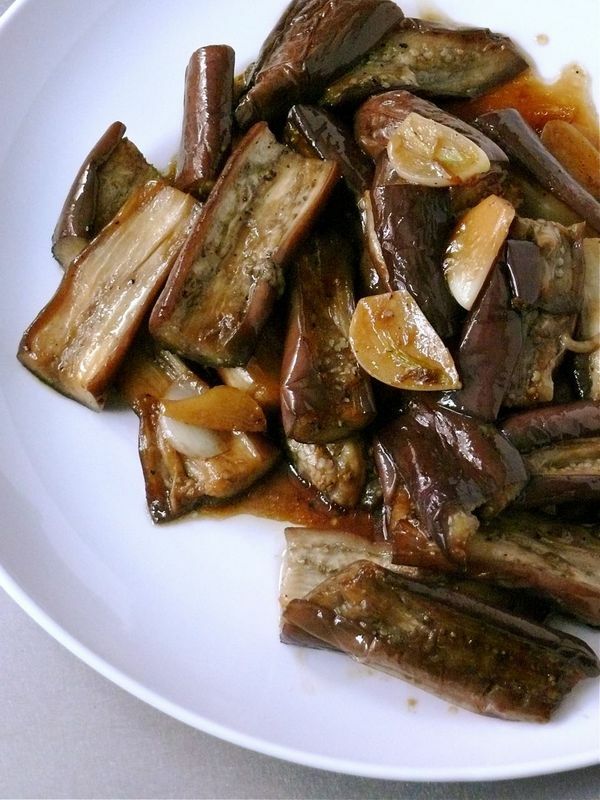 Add the tablespoon of oil and when hot, add the steamed eggplant and garlic. Stir and cook for 1 minute. Add the tamari, sesame oil and hoisin sauce. Stir well to coat the eggplant and cook for 1 minute. Season with salt and pepper as you wish and cook for another minute more. Serve hot over rice.